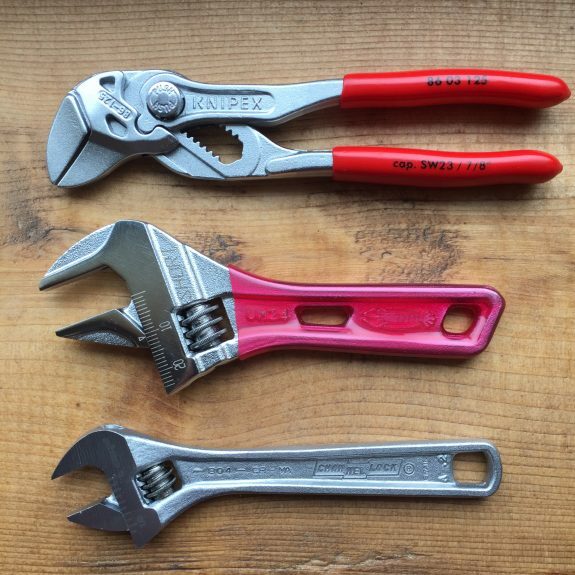 We compared the various pliers options in a recent edition of The EDC Tool Roll and that lead to a handful of emails asking for a comparison of the adjustable wrench options that we have covered so far. Most of the emails were basically asking if the Knipex Pliers Wrench was worth the cost over the other options. That is a personal decision but, hopefully, this comparison can better equip you to make that call. This comparison is not even really close on functionality. The Knipex Pliers Wrench has a trick up it’s sleeve that a standard adjustable wrench can’t match but they also cost more than twice as much as either of the other two options profiled here. The truth is, if you just need an adjustable wrench for your range kit, any of these will do. Quality – All three of these options are very high quality and will likely be heirloom tools if you don’t abuse them. The Lobster Shorty is an extremely high quality adjustable wrench with nearly perfectly flush jaws, polished flats, and smooth adjustment. The Knipex Pliers Wrench is everything you expect from Knipex. There is no clear winner here between the Lobster Shorter and Knipex Pliers Wrench. The Channellock 804 lags behind a bit but it is no slouch in the quality department. Features and Functionality – All three options have the same basic functions of adjustable parallel jaws but the Knipex Pliers Wrench goes beyond that basic adjustable wrench functionality. They offer easier, push-button adjustment and the ability to “ratchet” by simply loosening your grip as you reset the jaws on the fastener. This makes them 3-4 times faster to use than the other options when turning the same bolt. The Knipex Pliers Wrench is the clear winner on features. Size – The Knipex Pliers Wrench is the largest in the bunch but it also boasts the largest capacity jaws. The Lobster Shorty is the shortest wrench in the bunch but still boasts surprising jaw capacity. The Channellock 804 is the smallest and lightest overall tool in this comparison. All three of them are easily pocketable. Price – This is where the Knipex Pliers Wrench looses some of its luster. They will typically set you back around $47 – $55. Sometimes you can find a deal that is lower but there is no way around the fact that this is an expensive tool. I found the functionality that the tool offers to be worth it so I paid the price. The Lobster Shorty will run around $20 – $24. The Channellock 804 is around $18. Typically, the Knipex Pliers Wrench is more than twice the price of the other options. 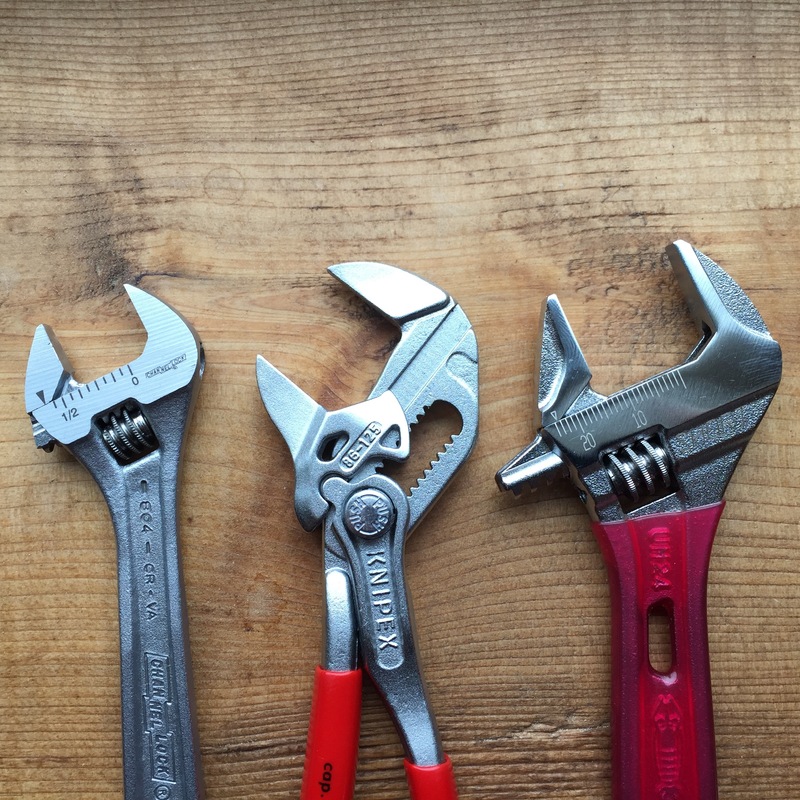 How to Choose – If you need the smallest and lightest adjustable wrench for a very compact kit, the Channellock 804 is the one for you. If you want an adjustable wrench that is small enough to carry but offers plenty of versatility due to it’s disproportionate jaw capacity, the Lobster Shorty is an amazing EDC wrench. If you like the finer things and appreciate the ratcheting functionality, the Knipex Pliers Wrenches are amazing tools. I carry the Knipex Pliers Wrench and occasionally the Lobster Shorter to go with it since you often need two wrenches instead of just one. Where to Buy – You can almost certainly find the Channellock 804 locally. The Lobster Shorty is imported from Japan so it is usually only available online (Ebay often has the best deal). You may be able to find the Knipex Pliers Wrench locally but the small version profiled here is unlikely to be found at a box store. Online is likely your best bet. There are a number of compact adjustable wrenches on the market at a variety of price points. Do you have one that we should try? Tell us about it below. Interesting concept, looks solid. I’d give them a try. I am an old fart that has little respect for adjustable wrenches since they tend to do damage if conditions aren’t just right. Good point on adjustable wrenches. I really only like them for my compact tool kit since I don’t want to carry every size of combo wrench that I can cover with a compact adjustable wrench. The nice thing with the Knipex Pliers Wrench is you can control how tightly they grip the faster with grip pressure. It is hard to round a fastener with them. Are you planning on doing a comparison of pry bars anytime soon? I don’t use them much but I may look into it. Are there any in particular you are thinking about? No, I was hoping you had a good one lol. So far your edc tool roll suggestions have been top notch. I feel like a useable pry bar might be too much to ask for in this size range though. I think you are probably right. All of the tools chosen for this series are ones that I have purchased myself specifically to be carried in a pocket. Pry bars need leverage and pocket size isn’t going to cut it. Still, I will keep my eye out for something.